At the time of this writing, my favorite altcoin exchange Binance has just announced that it will be temporarily disabling new user registrations in order to facilitate an upgrade of its infrastructure. It’s unclear how long this will last, but have no fear — if you’re new to cryptocurrency and want to get in on coins like FUN, XRP, or EOS, you’re not out of luck. I’m here to help! Since my articles usually focus on Binance as a means to purchase altcoins, I would be remiss not to quickly put out an alternate guide for those of you who want to get into the crypto world quickly. Thus, we’re going to learn how to use HitBTC, an exchange which advertises itself as “the most advanced Bitcoin exchange.” At the time of this writing this exchange offers excellent fees compared to many other exchanges. If you don’t have any cryptocurrency yet, altcoin exchanges like HitBTC aren’t going to help you until you first trade some fiat money (e.g., U.S. dollars) for a major coin like Bitcoin or Ethereum. 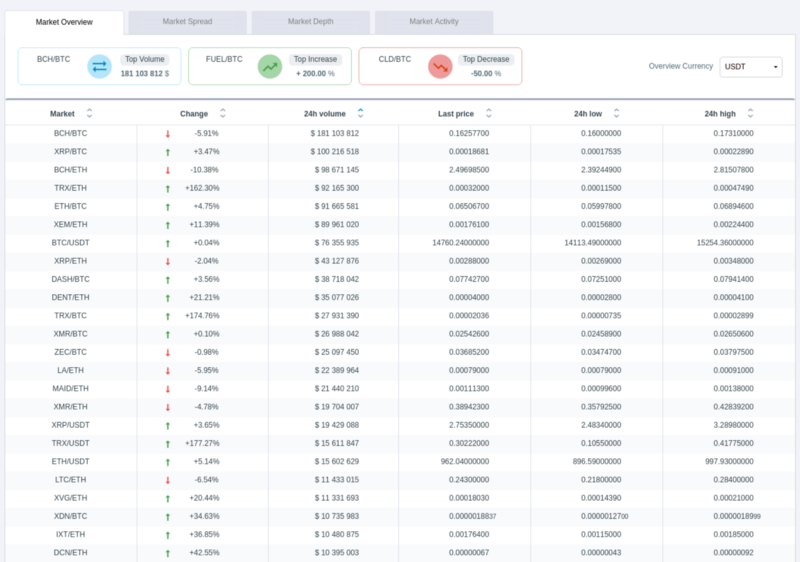 You can skip this section if you already have some ETH or BTC to trade for whatever altcoin you’re trying to ultimately buy. In my opinion if you intend to buy altcoins, ETH is the best choice to buy here. Why? Well, with regards to LTC, the reason is clear: other exchanges like HitBTC offer direct trading pairs for BTC and ETH, but not LTC or any other currency. What this means is that you could directly exchange your ETH for XRP, or your BTC for XRP, but you’d have to perform another step if you wanted to trade your LTC for XRP (and that means more fees!). Obviously we don’t want to waste even one cent if we can avoid it, so LTC is out. Time to deposit some coins on HitBTC! This guide will assume you already have some ETH that you’d like to use to use to buy Ripple (XRP). 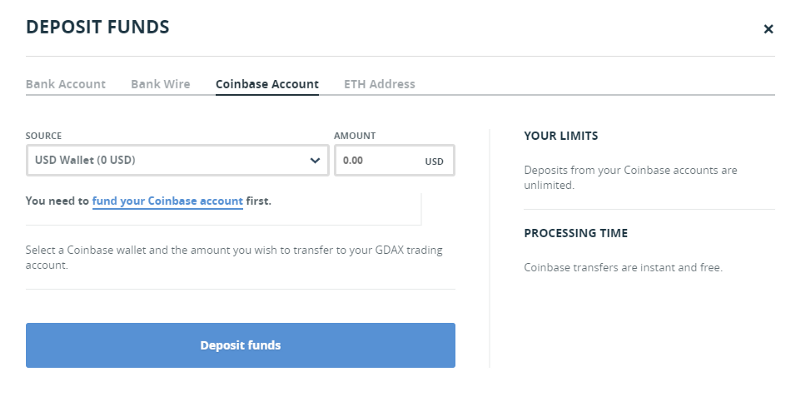 Simply click the deposit symbol to the right of “ETH Ethereum” in the list. You’ll be presented with a “Wallet address” and a convenient “Copy” button which you can use to copy and paste this address. Where I’ve placed a blue rectangle you’ll instead see a very long series of letters and numbers, which is the fundamental basis of most if not all cryptocurrencies. This “address” is simply the destination for funds — think of it like the account and routing numbers at the bottom of your checks. For many cryptocurrencies such as Bitcoin, it is possible to have multiple “receiving addresses” which point towards the same wallet. In this case, the address is where you will send your ETH so that HitBTC can add it to your balance, thereby allowing you to trade it for other cryptocurrencies like XRP. 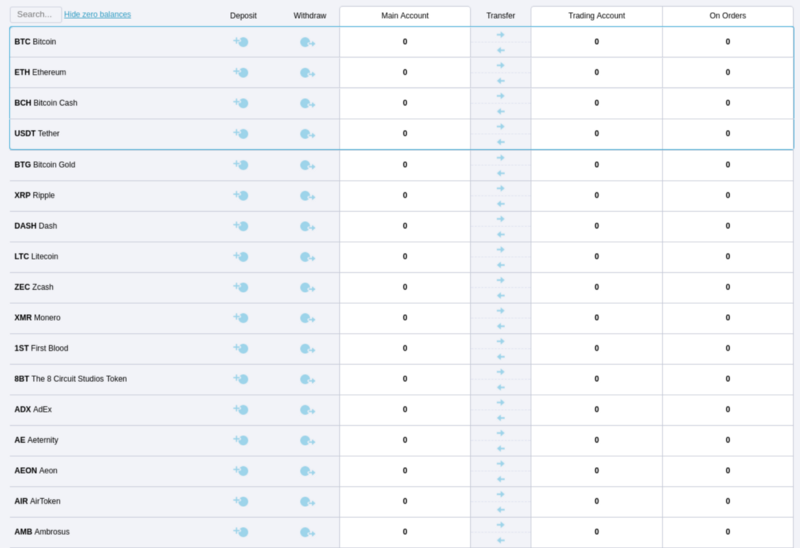 By the way, withdrawing coins from HitBTC is as simple as clicking the button in the “Withdraw” column instead, and inputting your wallet’s receiving address — more on this later. Once you’ve done this, you can click “WITHDRAW” in GDAX and send your funds from GDAX to HitBTC. Fees are significantly reduced with this method! HitBTC supports many cryptocurrencies, but not all. Time to buy some XRP with HitBTC! From here, it’s pretty straightforward to trade some ETH for XRP. Just click the number next to “Best ask” and the price will automatically be input. This number is a reasonable current average of the price — if you want to buy at a different price, you can put in whatever you want; just understand there has to be a seller who’s willing to sell at that price! Put a number in the “amount” field — this is the number of XRP that you’d like to buy. The “total” field will be automatically populated, and this is how much ETH you are spending for your XRP. Once you’re ready, click “Buy Limit” and you’re done! Now, if you want to be totally secure, there are more steps to this process. For most cryptocurrencies, it is ideal for you to withdraw your coins from HitBTC and store them in an offline wallet for security purposes. Use an inexpensive Android phone with the Coinomi wallet app, or go ultra secure with a hardware wallet like the Ledger Nano S or Trezor. The details of these wallets are a little outside the scope of this guide, but I have discussed them in previous articles. If you’re looking for more information about altcoins, take a look at my page — I’ve written a lot about this! If you’d like to read about more exchanges, I’ve also written about another alternative called KuCoin.